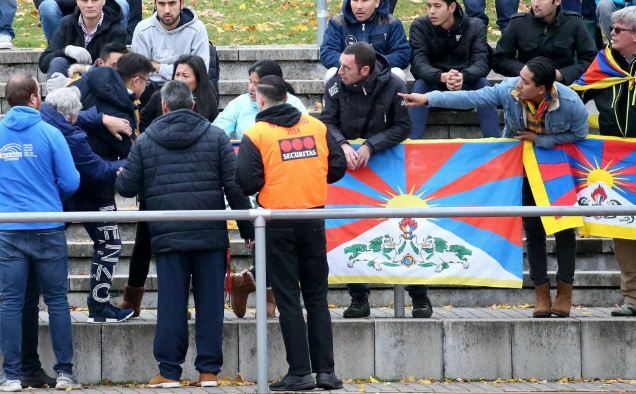 (TibetanReview.net, Nov29, 2017) – Following its under-20 team’s departure after cancelling a series of friendly matches with fourth division clubs, protesting against displays of Tibetan flags, China has said Nov 27 that it was still open to soccer cooperation with Germany if the latter handled such incidents properly. On Nov 26, The Chinese Football Association (CFA) announced that it had suspended a Sino-German soccer cooperation project under which China’s under-20 national team was scheduled to play in a fourth-tier league through May 2018. This was after the visitors’ debut on Nov 18 was interrupted by the Chinese side’s protest walkout over display of Tibetan flags by some spectators. China’s official globaltimes.cn Nov 27 blamed the disruption on what it called local Tibetan separatists. Following that incident, the two sides had, on Nov 24, decided to suspend the remaining three matches for this year pending discussions to resolve their difference over the question of Tibetan flag displays. However, after top German football officials maintained inability to ban Tibetans flags, with the German football association (DBF) president Reinhard Grindel saying, “Freedom of expression is also acceptable inside football grounds and stadiums,” the Chinese side decided to cancel the arrangement altogether. The globaltimes.cn report cited the CFA as calling the Nov 18 incident “regrettable” while accusing the DFB of failing to deliver a guarantee that similar events would not happen again. German, on the other hand, saw the Chinese reaction to the Tibetan flag displays as extreme. German Chancellor Angela Merkel had signed a five-year football partnership agreement with China’s vice-premier Liu Yandong last November. But the under-20 project, meant to improve China’s chances at the 2020 Tokyo Olympics, has now become a diplomatic headache. Liu was previously China’s top official on Tibetan affairs. The project and the German-China football treaty had been highly controversial in Germany in the first place, albeit for reasons completely unrelated to Tibet, noted a scmp.com report Nov 28. The report said the under-20 project was perceived in some quarters as the DFB beginning to open up German football to hostile foreign money, with three Regionalliga Suedwest clubs – Waldhof, Kickers Stuttgart und TuS Koblenz – refusing to participate amid pressure from their fans.